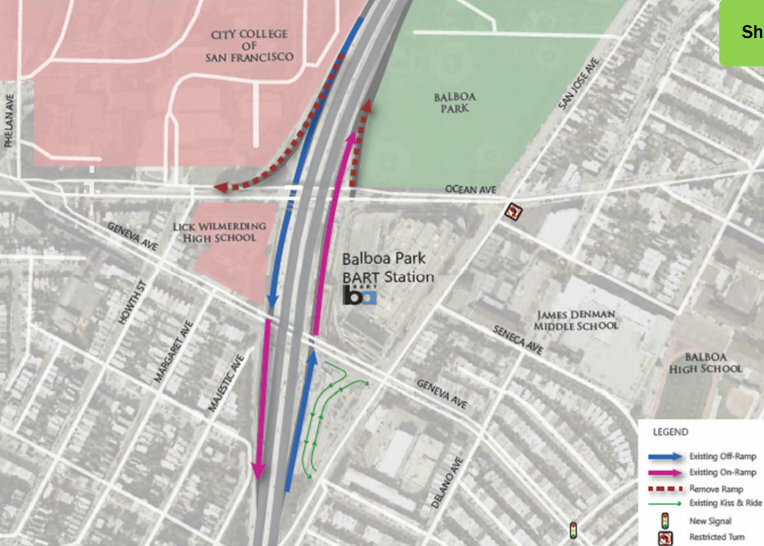 Balboa Park may be a major transit hub for BART and Muni, but it’s hard to tell as you approach the station, which is surrounded by dangerous roads swarming with car traffic moving to and from six nearby freeway ramps. The design of the area around the station — not to mention the 24,000 people who use it daily — feels like an afterthought to a freeway exit. The SF County Transportation Authority is considering options to remove some of the “redundant” freeway ramps to reduce the number of points where pedestrians and cars mix, while also simplifying traffic patterns and making the pedestrian environment less hostile. The agency has embarked on a study to explore how certain ramp removals or re-alignments would affect the area, and fielded input at a community meeting this week. The streets surrounding Balboa Park Station see about 1,000 pedestrians and 2,000 cars per hour during rush hours, according the SFCTA. 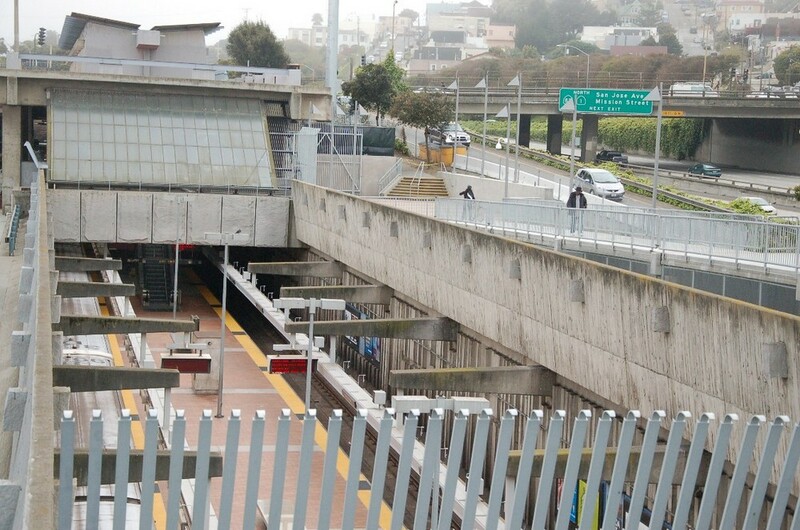 The station is bordered by the 280 freeway on its west side, and Ocean and Geneva on its north and south sides, respectively, which both carry numerous Muni lines and people walking to City College’s main campus and nearby neighborhoods. Ocean has a northbound on-ramp and a southbound off-ramp, which curves as an off-shoot that allows drivers to merge onto westbound Ocean at a fast clip through a pedestrian crosswalk in front of City College’s main campus. Four people were injured by drivers while walking near the off-ramp on Ocean between 2005 and 2010, according to a map of pedestrian injuries from the Department of Public Health. Meanwhile, Ocean’s uphill, westbound bicycle lane suddenly ends at the off-ramp, leaving bicycle commuters to take their lives in their hands as they merge with high-speed motor traffic on both sides. 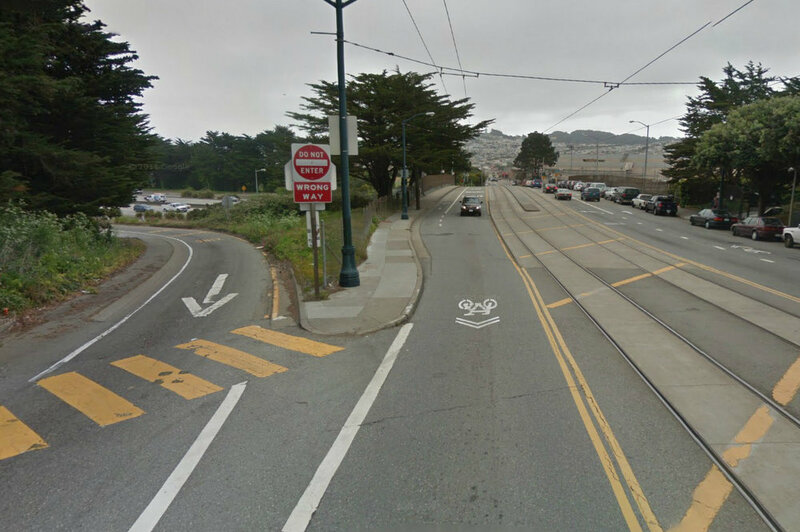 That off-ramp was “flagged” by planners for the dangers caused by high-speed motor traffic, and would be removed or redesigned under the options proposed by the SFCTA, said Fung. Planners have laid out two overall options [PDF] for ramp removals. The first, Alternative 1, would remove two of four ramp touchdowns on Geneva while retaining on- and off-ramp pairs on both Ocean and Geneva Avenues. The high-speed ramp on Ocean would also be redesigned as straight-facing off-ramp with a perpendicular touchdown, where a traffic signal would also be installed. A variation on this option (“Alternative 1B”) would include new one-way “frontage roads” on either side of 280, between Ocean and Geneva, raised over the space where freeway ramps currently run. Fung said those additions could provide more convenient pick-up and drop-off zones (a.k.a. “kiss-and-ride” zones), which are needed because many drivers don’t use the existing ones, instead dropping people off on off-ramps, which can be dangerous and delay car traffic. The second option, Alternative 2, would remove all ramps from Ocean and retain all four ramps on Geneva. That option seemed to be the least favored by attendees at the community meeting. While it would drastically reduce car traffic on Ocean, residents feared problems would be exacerbated on Geneva, including delays to the four Muni lines that use it. Fung said the SFMTA has deemed it impractical to move all of Geneva’s transit lines on to Ocean. Overall, the alternative most favored by attendees seemed to be Alternative 1, with or without the additional side roads, which could make the project significantly more expensive, said Fung. 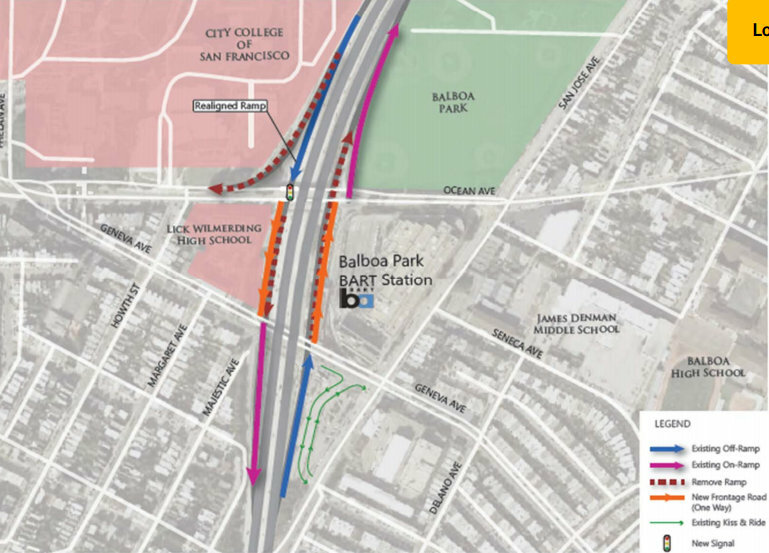 Other plans for the Balboa Park area have called for a deck constructed over 280 between Ocean and Geneva to provide more space for public space and buildings to bridge the freeway divide, but Fung said the high cost of that project means it probably won’t be implemented in the near future. The SFMTA and BART have made some improvements in recent years to make the street more accessible by foot and bike, including a new walkway connecting to Ocean and bike lanes which replaced car parking lanes on the Ocean overpass. The SFCTA plans to hold another community workshop in January and complete an implementation plan for ramp removals in winter 2014. The caption on the first image (of Alternative 1) appears to have the colors wrong (reversed). Blue are the off-ramps, pink are the on-ramps. The other image captions seem correct. These sound like some much needed improvements. Alternative 1 sounds better than Alternative 1B to me. “Alternative 2” seems to be a K-Ingleside booster while adding to the mess at Geneva + I-280. And “Alternative 1B” could be considered the “sell-out to the car drivers” option. P.S. 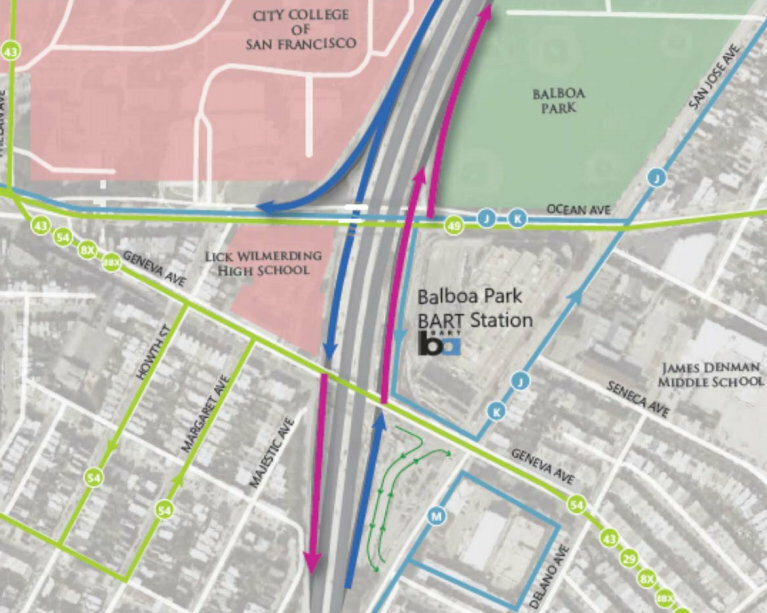 The “existing layout …” map from the SFCTA (also page 2 in the PDF) has a typo. It currently shows near the Geneva / Ocean merge these lines : “43 54 8X 8BX”. It should say “43 29 8X 8BX”. I wonder why they left out the #91-Owl. Am I the only person who thinks Alternative 2 is more preferable than 1? Ideally, Geneva should be emphasized as the car route (with transit-only lanes for the 8X and 43). Ocean could then be emphasized as a transit-priority street, since the TEP will have a number of routes (J, K, 29, 49, 54) operating on the corridor, which is narrower than Geneva and could cause congestion for the transit routes if traffic to/from Downtown used the Ocean offramp. One can see just how bad the traffic is with the backup of cars during the 8am and 6pm hours when students are trying to get to City College, affecting the 49. With decreased traffic on Ocean as a result of removing the offramps, there might be a better opportunity to install safe biking facilities. 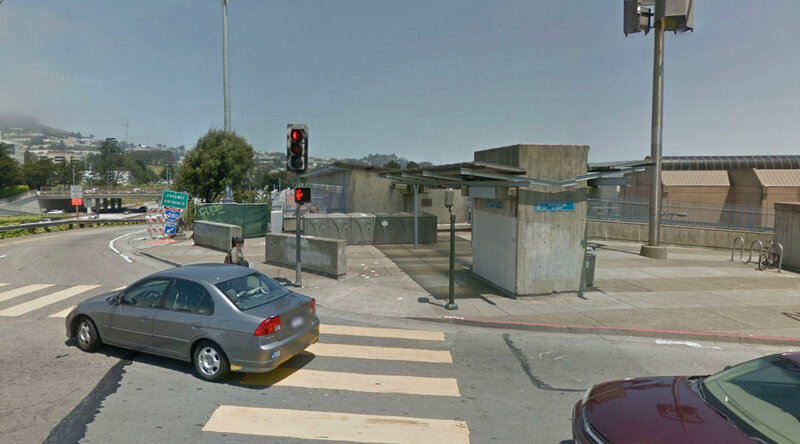 As I tend to think of Geneva St as the entrance to BART, I hate to intensify an area that’s already in poor shape. That’s my concern with Alternative 2. 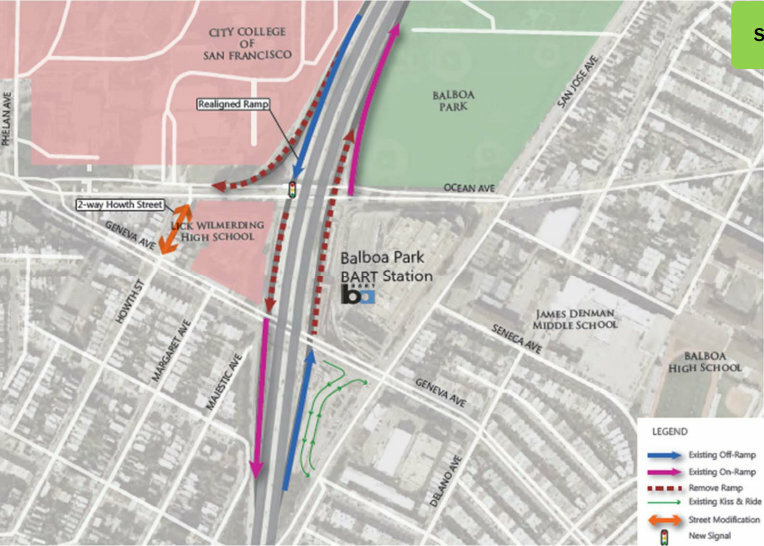 Here’s a link to the balboa park station area plan that included the freeway deck proposal that’s being tabled due to high cost. Hopefully these interim ramp modifications wont’ preclude the freeway deck in the future. Given how much this station is used, and given how much growth is expected in the area and given HOW MUCH TALKING IS BEING DONE ALL THE TIME ABOUT THE NEED TO IMPROVE It, you’d think there’d be some progress, but as we all know the MORE you TALK about something, the more you talk….and in 2096 they may make a few changes! Alternate 2 will increase carbon emissions more than 1 or 1A. A large part of the traffic exiting 280 at Balboa is headed for City College and other points along Ocean. Forcing all that traffic to go through additional intersections and to climb over an additional hill will add to the emissions. And it will be compounded by fact that the increased congestion will result in cars idling longer at lights and in back-ups. No again where do you think the people will go, do you think they will just disappear. No they will move to another ramp and it will double the traffic jams there. Everything you guys do these days is ANTI CAR, well I won’t have it I don’t know who put you guys in charge but I am going to work to get rid of you and your bike agenda. none of them are preferable. The more they do the more they screw stuff up. Leave it alone, every time these dumb *** do something they make it worse. We should get rid of the whole lot of them.